Prayer affirms our belief that there is something beyond our small, separate identity. When we pray we acknowledge that we are part of something bigger than ourselves. Prayer means we are willing to believe that this force of which we are a part is loving or, at the very least, has some interest in us. Otherwise why would we bother engaging with it? Prayer is a reaching out and a letting in of Love. 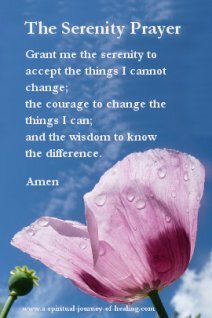 Prayer for some means the belief that God will change our world for us. For me it means that prayer works first in ourselves. God works in me to change my mind. As I change, the world and/or my experience of the world also changes. Prayer suggests a belief that we are united in a way that we cannot understand with our physical senses. If I believe my prayer for you makes a difference to you, then I believe my thoughts and words can change your life. Prayer is one way to open our minds to let in love. Only the love is real. The love of God is always HERE for us, NOW. It’s OK to practise believing in a God that cares about you. It’s OK to understand it is only your belief that He doesn’t which keeps Him out. Here are some different kinds of prayer and links to other articles on the website when available. Meditation as a form of prayer in which we take time to sit in silence to receive God's love and God's wisdom. Move from What Is Prayer? to read an article about moving from fear to faith. Motivate yourself in your commitment to prayer by getting clear on your personal reasons for why you pray. 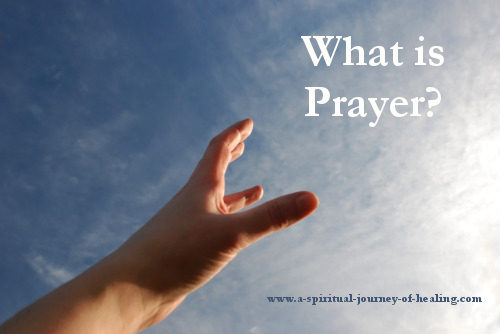 Practical Spirituality › List of Prayers on this website › What is Prayer?